Having grown up in central Pennsylvania, I consider pretzels their own food group. So it was a great disappointment to discover that there are NO pretzels in New Zealand. Oh, you can get small bags of expensive, imported pretzels, but the variety and quality are very poor. And soft pretzels—the pinnacle of pretzel evolution—are nonexistent. 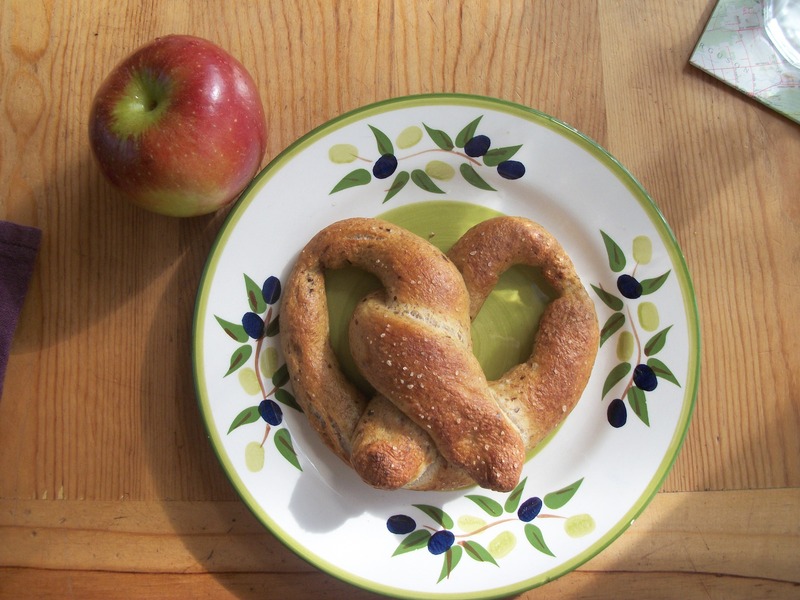 Thankfully, soft pretzels are easy and fun to make! I make soft pretzels from a light whole wheat bread dough—any relatively light dough will work fine. Once your dough has finished its first rise, divide it into 100g (3.5 oz) pieces. Roll each piece into a long snake, then twist into a pretzel shape and place on a well-greased baking sheet (You can make other shapes, but keep them compact or they will break apart when handled). Cover and let them rise until about doubled in bulk. Now comes the part that turns them into pretzels. Bring to a boil a mixture of 4 cups of water and 5 tsp baking soda (I use a large pot and need to double this amount to get a reasonable depth of water). Drop the pretzels carefully into the water (you may only be able to put 1 or 2 into the water at a time—my big pot fits 3) and allow them to boil for about 1 minute, until they float to the surface (I gently turn them over once they’ve reached the surface so that both sides boil relatively evenly). With a large slotted spoon, take them out and place them back on the greased baking sheets. Sprinkle with coarse salt and bake at 230°C (450°F) for 12 minutes or until nicely browned. Eat them hot, slathered in mild mustard!